As you would expect from Caldecott-winning illustrator Erin Stead, this book is beautiful. This isn’t so much a book for storytime (though it would work for that if the kids could sit up close to see the pictures and the details) as it is a meditative book for sitting with a child in your lap and looking slowly and enjoying the pictures. This is a book about time passing, specifically the time when winter is finishing up, and you’re waiting for Spring. It’s not particularly a book for southern California (where I grew up), but it’s lovely for more northern climes. all around you have brown. The bundled up boy and dog and turtle (even the turtle has a stocking cap at first!) plant some seeds. They wait and wait. They shed some wraps. It’s amazing how many different scenes Erin Stead makes out of that premise. And the poetry of the lines has its own music. On that page, three bears are in among the plantings, and one bear is scratching himself with the described sign. On another page, we see creatures that have made tunnels inside the earth as we look at a cross-section, with the boy and a rabbit with their ear to the ground and the dog and the turtle looking at a creature coming out of a tunnel. But don’t worry! Spring does come. This book has grown on me. The first time I read it, I leafed through it too quickly. This is a book for poring over, for reading again and again, and for sharing with a child. My library’s doing “Tech Games” — a series of 20 activities designed to teach staff members how to do various things on the internet. One of them is making a blog. Now, I definitely want to participate. But I do make a point of doing all my blogging on my own time, to reinforce that I do not speak for the library where I work, and neither does the library control what I can say. So I’m writing this on my off time, but will link to this post about blogging. I am pleased that my library is finally doing Tech Games. The county I worked for before Fairfax did the same thing years ago. It’s highly appropriate for libraries because we want libraries to be places where people come to get information. Since the internet is also about information, it’s a good fit. So it’s best if librarians are knowledgeable about tech tools and know how to use them. The point of Tech Games is to help us learn about any we haven’t used yet. And the best way is to learn by doing. And, yes, we can help you download free books to check out on your device, but we can also help in many other areas. When you think of people who can help you with technology, do you think of librarians? I hope so! In the comments, please mention ways you’ve been helped by a librarian, or a way you, as a librarian, have been able to help someone. Harcourt, Boston, 2012. 287 pages. Hooray! Jasper Fforde has taken his silliness, his clever quirkiness, and written a fantasy novel for young adults. The world seems fairly similar to ours — only with magic and dragons. And strange, quirky details, like marzipan mines and the poor and downtrodden marzipan addicts. Once, I was famous. My face was seen on T-shirts, badges, commemorative mugs, and posters. I made front-page news, appeared on TV, and was even a special guest on The Yogi Baird Daytime TV Show. The Daily Clam called me “the year’s most influential teenager,” and I was the Mollusc on Sunday‘s Woman of the Year. Two people tried to kill me, I was threatened with jail, had fifty-eight offers of marriage, and was outlawed by King Snodd IV. All that and more besides, and in less than a week. Jennifer Strange starts out the book managing a house full of magicians. She’s almost sixteen, a foundling, and an indentured servant, and she doesn’t have any magic herself, but their founder has disappeared, and she’s far more practical than any magic-user, so the post has fallen to her. When a premonition comes up that the Last Dragon is about to die, the whole country (and others besides) is in uproar. Because when a dragon dies, his lands can be divided up, on a first-come, first-served basis. When it turns out to have been foreseen that Jennifer is the Last Dragonslayer, she finds herself in the very center of earth-shaking events. Of the forty-five sorcerers, movers, soothsayers, shifters, weather-mongers, carpeteers, and other assorted mystical artisans at Kazam, most were fully retired due to infirmity, insanity, or damage to the vital index fingers, either through accident or rheumatoid arthritis. Of these forty-five, thirteen were potentially capable of working, but only nine had current licenses — two carpeteers, a pair of pre-cogs, and most important, five sorcerers legally empowered to carry out Acts of Enchantment. Lady Mawgon was certainly the crabbiest and probably the most skilled. As with everyone else at Kazam, her powers had faded dramatically over the past three decades or so, but unlike everyone else, she’d not really come to terms with it. In her defense, she’d had farther to fall than the rest of them, but this wasn’t really an excuse. The Sisters Karamazov could also claim once-royal patronage, and they were nice as apricot pie. Mad as a knapsack of onions, but pleasant nonetheless. When I finished this book, I actually laughed happily. It is highly possible that you have to have a similar sense of humor to truly enjoy Jasper Fforde’s work, but I certainly do. This book definitely stands alone just fine, and the story is complete in itself. All the same, I’m very happy to see “The Chronicles of Kazam, Book One” on the title page, because it will definitely be fun to visit this world again. I suspect that fans of Jasper Fforde’s books for adults will enjoy this one as well. The quirkiness and esoteric references are toned down a tiny bit, the book is shorter and the protagonist younger, but the flavor is the same. And I do hope that it will capture some fans for him much younger than before. Who says high fantasy has to be deadly serious? This is a book that will make nerdy teens laugh, and I say that with utmost respect. Wow. This book will grab you and keep you turning pages. And I hope it will adjust your opinion of homeless people. This book tells how one person ended up there. Yes, she had a difficult upbringing. She did have a job, much of the time, and even a trailer to live in. But she definitely doesn’t fit the stereotypical picture of a homeless person. Reading her story definitely made me think. I was hoping the book would end with Brianna happily married and living in a house, never to be homeless again. Spoiler alert: It doesn’t. But the story of her journey is compelling and moving. She knows how to tell her story so that you feel for her, but don’t pity her. She does show how to be homeless with dignity and self-respect. I truly hope that this book will have incredible sales. Did I mention the story is a page-turner? As a public librarian, I deal with homeless people every day. I’m sure there are many I don’t know are homeless, but I know that the library is a great place for homeless people, since our services are open to all and everyone is equal there. This book increases my respect for them, and that’s a good thing. And did I mention it’s a great story? “The most irritating thing, I found, is when people question ‘luxury’ items like phones, laptops or vehicles. ‘I just saw a homeless person with a cell phone! Guess he’s not really homeless.’ ‘Wait a second, how do you blog if you’re homeless?’ ‘Why don’t you sell your phone and laptop and car and buy food or rent an apartment?’. . .
“I can understand potentially taking issue with government money being misspent — if a homeless individual is receiving housing funds for a very specific, designated purpose from an assistance program, and spending them elsewhere. But personal income? It’s yours, you’ve earned it, and if you want to use it to buy a cell phone or a laptop or a book or a necklace or even a goddamn pack of cigarettes because you feel that any of the above will improve the quality of your life or just plain make you feel a little happier or more humanized for a short while, then good for you. I will never be the one to demand to know how much it cost you or look at you askance and mutter about how you wouldn’t be homeless if only you didn’t buy A, B or C. It’s basic respect, and I don’t think that basic respect and the right to privacy end when you lose your home. . . . This book will entertain you, but it will also make you examine your own attitudes. It’s Sonderling Sunday! That time of the week when we play with language by looking at the German translation of children’s books. You do not have to speak German to enjoy these, and you do not have to read the books. In fact, not having done these things might well make the chosen phrases more bizarre, and thus more fun for those of us with a Sonderling sense of humor. As I’m writing this, I’m about to experience my very first hurricane, and I find it frightfully funny that it is named Sandy. No wonder she is raging — she ALMOST got a really great name! Now, it didn’t happen that Sandy struck Sondy on Sunday, but I do have Monday off. Here’s hoping that the only way Sandy will affect me is to get some extra time off work to read. But we shall see. Anyway, I can stay up late tonight writing Sonderling Sunday and tomorrow sleep late! 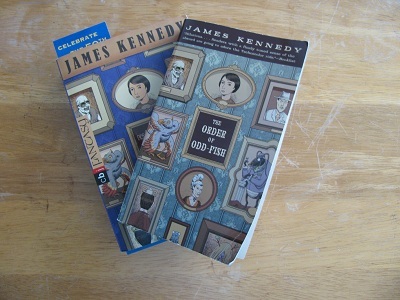 This week, we’re back to the original Sonderbook that started Sonderling Sunday, James Kennedy‘s The Order of Odd-Fish, Der Orden der Seltsamen Sonderlinge. 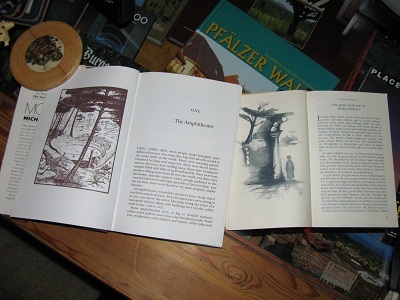 We left off on page 124 in English, Seite 158 auf Deutsch. “The Prancing Gobbler!” = Der Stolzierende Schlinghals! Now, didn’t you want to know how to say this? Well, I’m afraid I’m going to have to stop in the middle of a section. I’m feeling strangely dizzy tonight, and I’m guessing it’s a vestibular migraine starting from the extreme low pressure in the approaching hurricane. (Drat that Sandy!) Here’s hoping that I can sleep it off! Meanwhile, can you use one of these phrases in a sentence? Maybe translate into a different language yet? As for me, I guess I stopped because ich bin plötzlich so grün im Gesicht. I hope the sounds of the storm won’t have me waltzing in my bed tonight! I will try to sit out the storm tomorrow in Plüschsessel. Bloomsbury, New York, 2012. 276 pages. Abby Hale lives in a world where it’s normal to have magic. She’s the youngest of five children, and her two older sisters and two older brothers all came out as having very high levels of magic at their Judging. But Abby? She’s twelve years old and ready for her Judging. And it turns out she has no magic at all. She’s completely ordinary, called an Ord by “normal” people. Ords are considered barely human. However, they do have one skill in this magical world — magic doesn’t affect them, so they can walk right through charms and protective spells. Because of this, Adventurers like to have an Ord along to make treasure accessible. And they’re willing to do whatever it takes to get one. Fortunately, Abby’s family would never sell her, ordinary or not. In fact, her sister works at a school established for Ords in the capital city, a school that’s supposed to keep them safe. But staying safe isn’t easy in a world accustomed to thinking of Ords as having no rights. This book was a lot of fun, especially all the ways it was exactly the opposite of Harry Potter. Instead of learning she’s a Wizard in a world of Muggles, Abby finds out she’s an Ord in a world of Magic Users — normal people. All the authors we read are boring. All the stories we read are about people hating each other and being miserable. And there aren’t even any carpet chases or magic fights or somebody turning somebody else into a toad. There are no dragons. How realistic can you be without dragons? In another place, parts of their house have been unmagicked, so that Abby can get around in it. I knew it was a pain for my family at first — to have to use little knobs to turn on the water in the bathroom instead of just poofing the perfect pressure and temperature, and having doors open to just one room instead of whatever room it was you wanted — but nobody said anything. “Why? So we’re ready to be bought and sold?” Peter muttered under his breath. “In case you’re bought and sold,” Mr. O’Hara answered so everyone could hear. “I think you’ll find escape much easier if you know the local language.” And then he spent the rest of the class introducing us to Astrin and teaching us the tourist basics, like hello, good-bye, please, thank you, and help, I’m being kidnapped! What happened next was my fault. I just want to say that straight out. I know Olivia blamed Peter, and Alexa blamed, you know, the actual people responsible, but I should have known better. Once she’s said that, at the beginning of the chapter, you just can’t think that she’s going to be away from Olivia and Alexa (her sisters) for very long at all. If they’re arguing about who’s at fault, we know she gets out of the situation before too long. In another place, we read, “King Steve told me later that they modeled the alarm system on the cries of real-life banshee.” That takes the teeth out of a sentence on the very next page which includes the phrase, “if I got out of this and saw King Steve again…”. I also wasn’t completely satisfied with where it ended. In the Harry Potter books, I always scoffed that these adventures took precisely one school year. In this book, though there is a climax, the adventure doesn’t feel complete. We have some very important loose threads left hanging. The book ends at the end of the school year, but it feels like a random place to end. However, these were minor details in a delightful debut novel. This book is full of good-natured teasing between a family who loves each other. It pokes fun at conventions of fantasy stories by turning them on their heads. And along the way, it creates a credible imaginary world and fleshes it out with details. As well as looking closely at how it feels to be on the wrong side of prejudice. I definitely want to read the next book just as soon as it comes out. I want to find out what happens to the loose ends left hanging, and, especially, I want to spend more time with Abby Hale and her family. It’s time for Sonderling Sunday! That time when I use children’s books to give interesting and enlightening translations of phrases that must be useful — they’re used in a children’s book! This is intended to be interesting even for readers who don’t speak German, but who find words even a little bit fascinating. 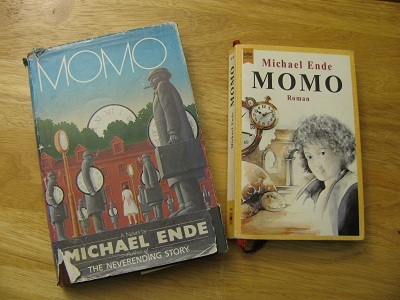 I wanted to look at a book originally written in German, and of course the first book I thought of was Momo, by Michael Ende. Momo was the first book I ever purchased from Book-of-the-Month Club, and worked out so well, I blame it for my subsequent addiction. Momo was, I believe, the first book my husband-to-be and I read aloud to each other. We later read it aloud to our boys. A copy of Momo, in the original language, was my very first purchase when we moved to Germany in 1996, along with a hiking map of the area we moved to. Even if I couldn’t read it yet, I wanted to own it. I can’t quite put Momo above Anne of Green Gables in my list of all-time favorite children’s books, but I consistently call it Number Two. Besides being a good story, Momo is mythic. Gray men come stealing people’s time. They convince people to save time — and then they steal it. Momo is the only one who can see them, since she has a gift of listening. My then-boyfriend and I were finishing reading this book aloud during Finals Week in college. We knew we “didn’t have time” — but it’s not a book you can use that excuse not to read! This book is only slightly longer in German than in English, unlike some others. However, my English edition uses much larger print than the German one, so that may be a factor. It is 227 pages in English, translated from 285 pages in German. Now I’ll go to some phrases from the first chapter. This time, since the original language is German, I’ll begin with the German, then tell how it was translated. Now, for a little fun. Can you use any of these phrases in a sentence? How about translating them into some other language? How do you say “ankle” in Chinese, for example? Or “snug little room” in Spanish? My favorite phrase from tonight’s chapter was knipsten das Erinnerungsfoto, because I did lots and lots of that all over Europe during the ten years we lived in Germany. But I also have a jacket that I wear deren Ärmel an den Handgelenken umgekrempelt waren. Now when I do so, I will think of Momo. Greenwillow Books, 2011. 423 pages. This is an impressive debut fantasy novel. The author builds a complex, realistic world, and stands a few fantasy conventions on their heads. “Prayer candles flicker in my bedroom. The Scriptura Sancta lies discarded, pages crumpled, on my bed. Bruises mark my knees from kneeling on the tiles, and the Godstone in my navel throbs. I have been praying — no, begging — that King Alejandro de Vega, my future husband, will be ugly and old and fat. Elisa is the Chosen One. The whole world knows because of the Godstone in her navel. And her god communicates with her through the Godstone. There are prophecies about her. One thing I like about this is that no one agrees on what the prophecies actually mean. That seems completely realistic, after all. If there were a prophecy, isn’t it likely that whole factions would have different beliefs about what that prophecy means, about what the Chosen One can do for them? Elisa’s an unlikely heroine, too. She loves to eat, and is overweight and lazy, at least until circumstances force her to change. This book involves war, state politics, danger, adventure, romance, and even religion. The biggest thing I didn’t like about this book involved my personal prejudice against present tense novels. Most of the time, the story was able to overcome that so I didn’t notice, but not all the time. Still, Rae Carson built a fascinating world with this book, and the story is clearly not finished. I will definitely want to read this book again when the sequel comes out and spend more time with these characters. Splendors and Glooms has been nominated for consideration in two groups I’m part of: Capitol Choices, and the Cybils Awards. I’d already heard speculation about it for the Newbery Medal on Heavy Medal blog. So I wasn’t surprised to find excellent writing. The story, however, isn’t up my alley. We’ve got a sinister gothic horror tale, beginning in the fogs of London in 1854. There’s a creepy puppeteer who bullies the boy and girl who live with him. There’s a poor little rich girl who lives among memories of her four dead brothers and sisters. And there’s a dying witch, living removed from London, who desperately wants a child to steal her magic fire opal so that she can give it up, so that she won’t be consumed by its fire. Fans call the book “atmospheric.” I found myself calling it “creepy.” Now, the creepiness is wonderfully crafted. We feel the sinister squalor in which the children live with Grisini, the puppetmaster. We feel the impending doom of Clara’s obsession with the puppets. Here’s a conversation between the children who live with Grisini after the rich girl, Clara, has disappeared. Lizzie Rose gave a little shiver. She wasn’t promising anything. So the story is spooky, with slow-growing realization that these children are in the thick of something bad, something dangerous. But on the other hand, the plot is very slow-moving, and by the end the revelations have been foreshadowed so many times, they’re rather anticlimactic. The characters aren’t very likeable, and I found the book awfully easy to put down along the way. What do you think? Many are lauding this book as a prime Newbery candidate. Laura Amy Schlitz certainly uses language richly and creates a setting where you can almost feel the fog clinging to your clothes. For the Cybils, I’m not sure I can recommend this book as one having kid appeal. But perhaps I’m simply the wrong audience, since in general I don’t like creepy books. I know lots of kids do. If you’ve read the book, I’m curious if you thought the heavy foreshadowing was a flaw or a strength. Feel free to discuss spoilers in the comments. Wendy Lamb Books, 2012. 307 pages. The Mighty Miss Malone is a companion book to Christopher Paul Curtis’ Newbery Medal-winning book, Bud, Not Buddy. I read Bud, Not Buddy so long ago, I didn’t really remember it, so I can confidently say that did not in any way reduce my enjoyment of The Mighty Miss Malone. Bud makes a very short appearance in this book, but mostly this one is just set in the same time period of the Great Depression. This book is all about Deza Malone. Deza Malone is the smartest person in her class, and she knows it. She wants to be a writer, so of course she uses her dictionary and thesaurus a lot — too much, according to her teacher. Deza’s excited about getting extra teaching from her beloved teacher. But then her father loses his job and her family loses their home. Her father goes on the road to find work, and they in turn try to find him. Along the way, we see Deza, her brother Jimmie with the voice of an angel, and her parents interacting with lots of laughs and lots of love. Deza’s family has a motto: “We are a family on a journey to a place called wonderful.” I’m glad I got to go along for the ride. You are currently browsing the Sonderbooks blog archives for October, 2012.